Recently I curated an exhibition about the Training Ship Wellesley for Segedunum Roman Fort and Museum, School Ship on the Tyne – The Training Ship Wellesley at North Shields 1868 – 1914. The exhibition was timed to mark the centenary of Wellesley being destroyed by fire, March 11th 1914 and runs from 3rd April – 13th July 2014. 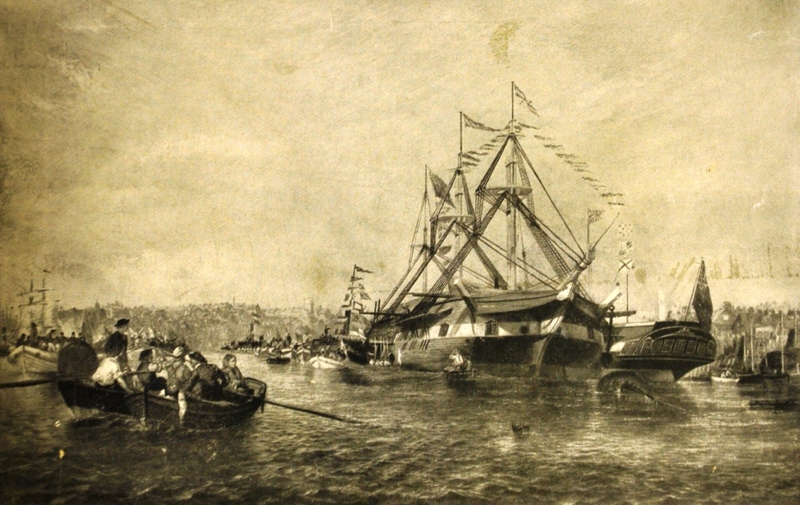 The driving force behind having a training ship on the Tyne was James Hall, a local shipowner. 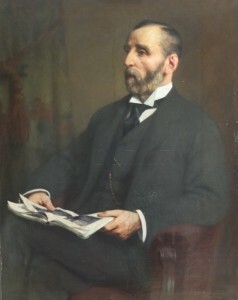 Hall was worried about declining numbers of British seamen aboard the nation’s merchant ships, but he was also a social reformer with concerns about the links between poverty and crime. 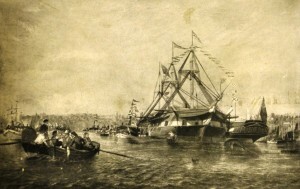 He proposed that a ship be brought to the Tyne and an Industrial School be established aboard. The Industrial Schools Act of 1866 had given magistrates the power to send to a certified industrial school any destitute child under 14 years. James Hall saw this as an opportunity both to help neglected boys and ensure a steady supply of British seamen to the merchant fleet. The former 74 gun ship HMS Cornwall was acquired and brought to the Tyne. 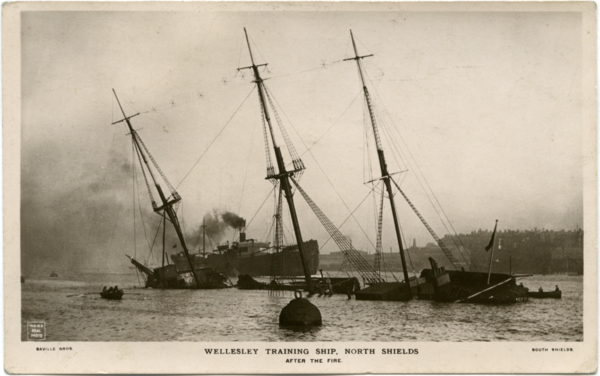 The ship was moored opposite Coble Dene, North Shields and on July 30th 1868 she was inaugurated as the training ship Wellesley. In 1873 HMS Boscawen replaced the old Wellesley and took on the Wellesley name. She was still at the Coble Dene mooring when the nearby Albert Edward Dock opened in 1874, but soon after she was moved to a mooring off the North Shields Fish Quay. Most likely her presence moored close to the entrance of Albert Edward Dock was a hazard for ships entering or leaving the dock. There was an expectation that many boys would go on to a life at sea, but Wellesley was primarily an Industrial School. Seamanship skills were taught, but schooling, and what we would call work experience, were given a higher priority. Boys received an education that was comparable to that which they would have received in an ordinary school. 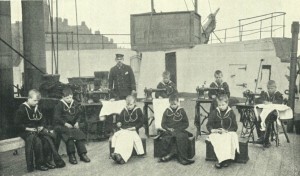 There were examinations every year and boys received a grade just as they would have done ashore. 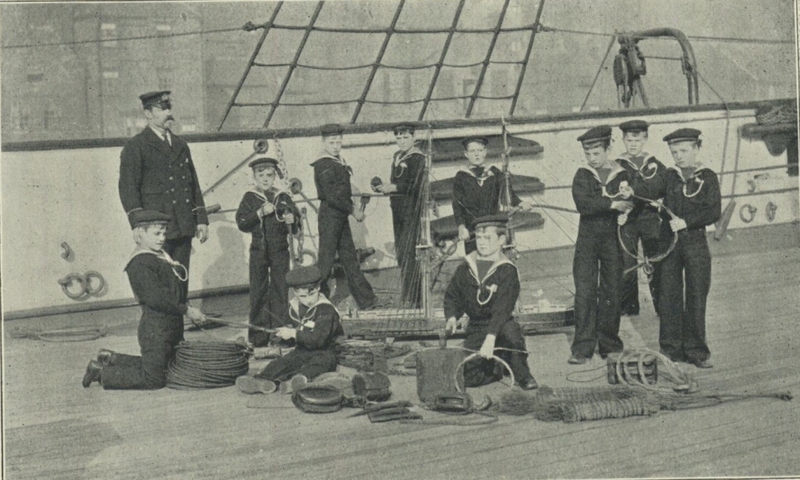 In 1906 Wellesley sent 69 boys to sea in British merchant ships and 2 boys to foreign vessels. 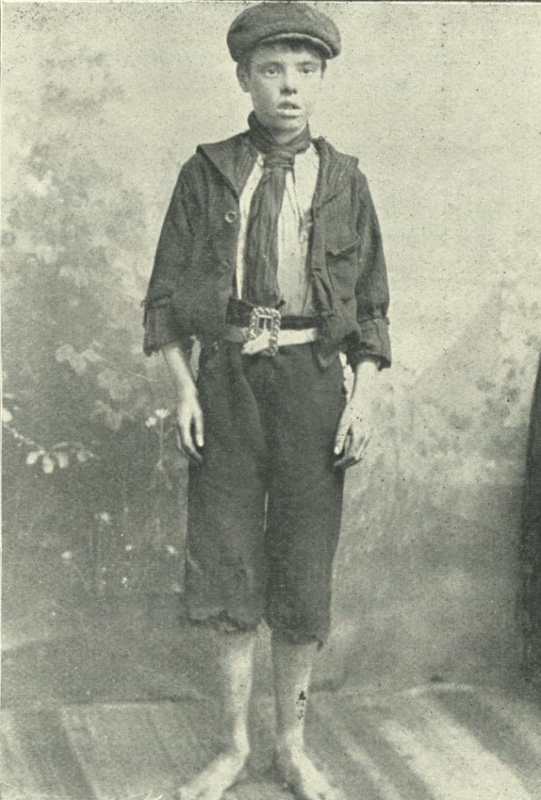 E J Hatfield was brought to Wellesley from a children’s home in Meriden, Worcestershire aged 12. He seems to have thrived on the ship and was trained as a tailor. He was on the Wellesley when she caught fire in March 1914. In 1916 he left the school and joined the oil tanker ss Massasoit as an ordinary seaman and signal boy. He was still in the Merchant Navy at the end of the First World War, by then an Able Seaman who was beginning to make a success of his life. A key figure in Hatfield’s life was the tailor master aboard the Wellesley, Mr Warnly. Hatfield was probably partly chosen to be a tailor boy because of his small stature, but his abilities with the needle soon made him a favourite of the tailor master. When Hatfield went to sea he kept in contact with Mr Warnly by letter. After a year of correspondence the tailor master and his wife invited Hatfield to come and stay with them when he was paid off from his ship. 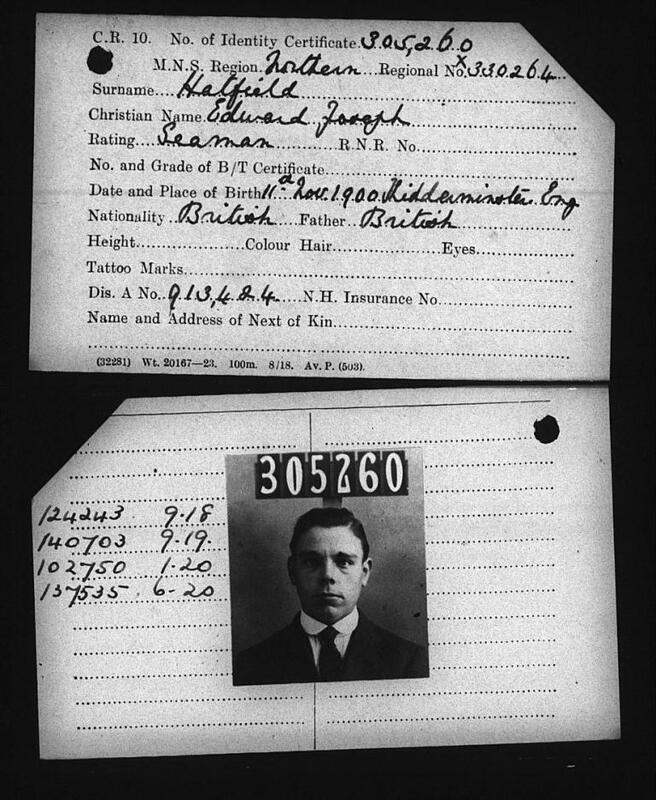 Hatfield continued to spend most of his time at sea but at last, aged 18, the boy from the children’s home had a family and a place he could call home. In 1977 the now Captain E J Hatfield was interviewed about his life aboard the Wellesley in a series of recordings lasting over three hours. These are now part of the audio collections of Discovery Museum. From the recordings we know that eventually he became a master mariner, and he was married, but apart from that we know almost nothing of his life between 1919 and 1977. Captain Hatfield’s memories of the Wellesley form the authentic ‘voice’ behind the exhibition. I found listening to the recordings fascinating, but also at times moving and sad. Since the exhibition opened, a colleague, Adam Bell, has shown me how to access online copies of Merchant Navy identity cards for Hatfield. These have given us his first and middle names, Edward Joseph, and provided a black and white photograph of him taken in 1918. We also found out that he was 5 feet 5 inches tall (1.65m), had brown eyes, dark hair and a dark complexion. At 2.30 on the afternoon of 11th March 1914 a fire broke out in the Wellesley’s drying room. 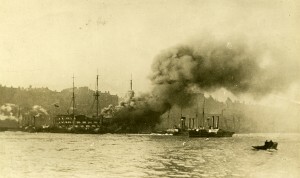 It quickly took hold and, despite the efforts of the boy firefighters and Tyne Commissioners fire tugs, the fire spread right through the ship. 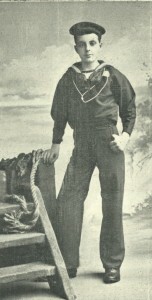 Hatfield was on board the ship at the time and he talked about what happened on one of the recordings. Here’s an extract from the transcript of Hatfield’s interview to give a flavour of what it was like for the boys when the ship caught fire. You can hear Hatfield talking about the fire in the exhibition at Segedunum. E J Hatfield was among a group of boys operating a manual pump on the orlop deck. The pump was worked continuously until the order was given to abandon ship. As soon as the boys stepped back on one side others would take over. The boys carried on pumping even though they could see flames coming up from the bathroom below. When the order was given to abandon ship the boys were mustered on the main deck and then they went over the side in an orderly fashion. Hatfield went into the tug Vigilant, but there were also other vessels taking boys and staff off Wellesley. 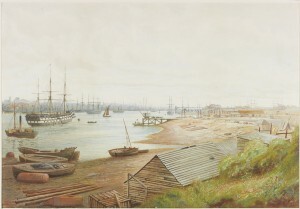 Soon after 6 pm the ship settled down on the bottom at her moorings, with a large part of her upper works and masts remaining above the surface of the river. 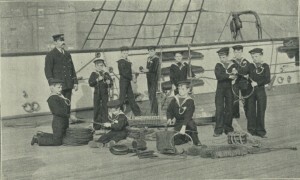 All the boys were taken on board the drill ship HMS Satellite where they stayed for the next two weeks. Satellite was cold in comparison to the centrally heated Wellesley and blankets given to the boys were infested with lice. After the fire it was clear that Wellesley was a total loss and she was broken up. Satellite was not suitable as a school ship so a new home had to be found. The Wellesley boys were transferred to the Tynemouth Palace (known more recently as Tynemouth Plaza and demolished after a fire in 1996) where they stayed throughout the First World War. After the war the need for a permanent home became urgent and the management committee was fortunate to secure the recently built submarine base at Blyth. The boys moved into the base on 18th May, 1920 and Blyth remained the home of the Wellesley for the next 86 years. From the 1930s onwards Wellesley became more of a reform school but still took boys on a voluntary basis or who were destitute. In 1973 Wellesleybecame part of Sunderland’s Social Services Department. Gradually the nautical aspect of the school was reduced in favour of general education and training. Eventually Sunderland decided to close the operation and in 2006 Wellesley was shut down. The exhibition continues until July 13th 2014. I am a third year Maritime History and currently undertaking my dissertation on Training Ships. I am looking for primary sources and was wondering where I can obtain some on Training Ship Wellesley. Any help would be very gratefully received. Thank you one very overwhelmed mature student. Ah, the joy of a final year dissertation! I remember it well, and also as mature student. As to primamry sources….. “The Illustrated Guide to the Wellesley” (c1906) was written by Captain Baynham, who was in command of Wellesley at that time, and is full of information and photographs, including quotes from other contemporary documents, letters etc. There is a copy in the public searchroom of Tyne & Wear Archives in Discovery Museum, Newcastle, but I think they are quite rare. There is a collection of Wellesley archive material in the Northumberland Record Office at Woodhorn Museum. It covers the Wellesley Nautical School as well, so beyond the 1868 – 1914 period of the training ship, but the Admissions book from 1868 onwards is a fascinating document and very well worth a look. These suggestions may not be very helpful if you aren’t based in the North East, but this is what I used for the exhibition i curated at Segedunum Roman Fort and Museum. I am at Hull University so it is not too far to come, provided the weather is kind I will drive up during my research break in January. Mandy, did you finish your dissertation? I’d be interested in getting hold of a copy. I’d like to find out about further ships around the UK. Which university were you at? I’m glad you found it interesting. I’m afraid I don’t have any information about your great grandad but I hope that somebody reading your comment will be able to help. My husband’s ancestors ran a Training Ship in the Shields in the 1850s -1860s. I would be interested in making contact with you. Hi my grandfather was headmaster ,we must be related .My grandmother was Alice Purvis. Please get in touch as my grandmother was Alice Purvis, Her father,my great grandfather was Thomas Sanderson Purvis . Thanks for getting in touch. I’ve contacted you by email to hear more about the activities of your husband’s ancestors. Who painted the picture on your wall? 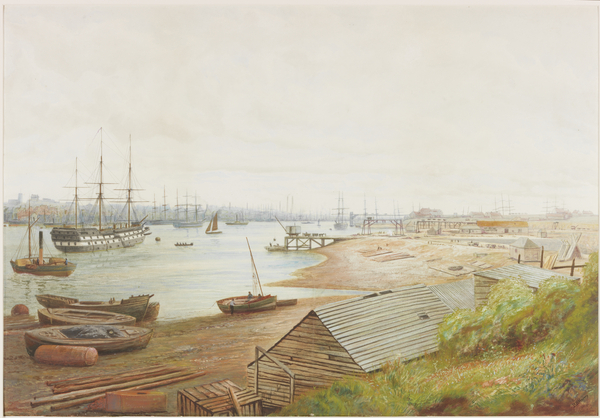 I have researched my relative, the artist John Chambers, who painted the Wellesley many times. Pictures of the first Wellesley (1868-1873) are rare but images of the later Wellesley (1873 – 1914) are quite common. 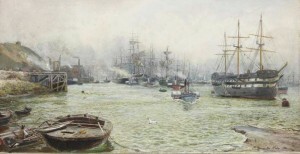 She was a distinctive and picturesque backdrop to the new generation of steamers going up and down the Tyne, and was also a sure sign that the artist was in North Shields. Artists, photographers and postcard publishers all produced imagery of the Wellesley up to (and including) the fire that destroyed her in 1914. Just doing some genealogy and find that in the 1881 Census my grandfather Robert Maule Ramsay was aboard the Wellesley at 11 years old. He also ended up as a Master Mariner. The Admission book you mention interest is it possible to obtain an extract without travelling from the southern hemisphere? Your advice please. Those Wellesley boys certainly got around! Yours is the second query I have had from a Wellesley boy descendant in the southern hemisphere, although the other enquiry didn’t come in via the blog. I would contact them and see if they are able to check for Robert Maule Ramsay’s admission to the ship for you. They might charge a small sum but it will be cheaper than flying all the way over here! Just a word of warning, since from my own experience your grandfather might not be in there. The register definitely doesn’t record every boy who came to the Wellesley. 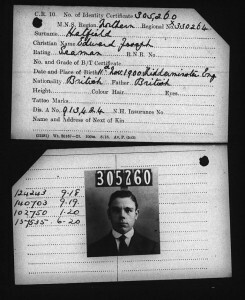 Captain Hatfield for example, who came voluntarily from a children’s home, isn’t recorded in the register. The book has columns to record the names of the magistrates who committed boys under the Industrial Schools Act of 1866 and I think that some of the admissions that weren’t subject to the Act aren’t in it. I have acted upon you suggestion and am now just keeping my fingers crossed. I have award medal for the proficiency in swimming exercise that has an engraving of the training ship Wellesley 1904 that was left by my father which I am not sure it is valuable and should be displayed somewhere or there is a lot in circulation, has anyone any idea? I am trying to trace records relating to my father, Cecil Page, who was at the Wellesley training ship/school for a period between 1911 and 1924. 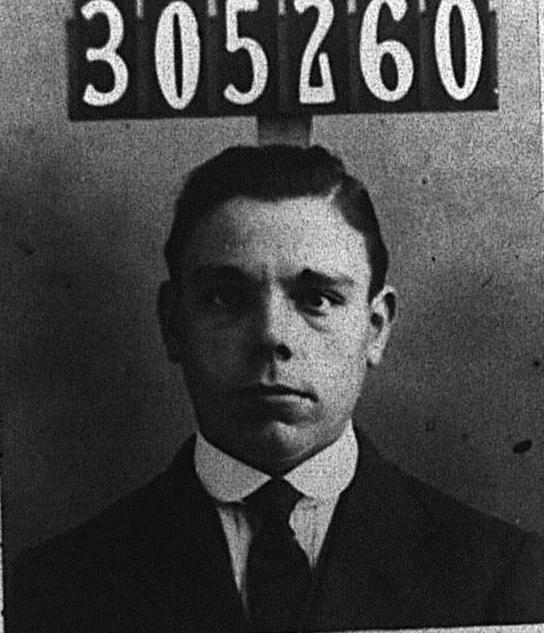 I have a swimming and diving certificate dated 1st May 1923, and I know he enlisted in the Army as a boy soldier in 1924. I do not know when his Wellesley attendance started, or from what institution or family member he was living before that. His mother was unmarried when he was born, and she emigrated to Australia, leaving him in the care of her parents in Surrey some time between his birth in 1908 and 1913, when I know she was in Australia. He could have been associated with the training ship Wellesley and the training school. 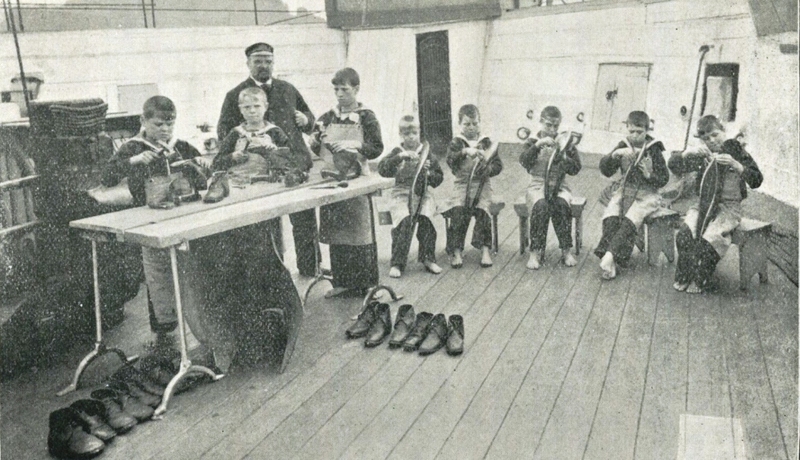 I would be very grateful for information regarding records of the training ship/school that are accessible online. I live in Spain, so onsite reference is not possible. Hallo Ian. We`ve just moved into Wellesley Court on Lawe Top, the old Pilots Office. Is there any significance in having the old flagpole outside what is now converted flats? Ian, can you tell me anything regarding the Wellesley Hospital? It is is the Ward’s Directories for South Shields from around 1890 to 1911 as at 12, Green’s Place, which is next door to the Pilots Office which was at 11, Greens Place. From the little I have gleaned so far there was a hospital attendant in residence and the hospital was for T.S. Wellesley personnel. This was originally at “Green’s Home” in Mile End Road but must have moved when the home became “Green’s Industrial School for Boys”, taking in boys from 7-12 before they transferred to the Wellesley. My mother was rescued off the Wellesley as a young baby. Her father was the captain (Kitcat) at the time. on going to Blyth an uncle of mine Jack Kitcat was the Captain of the school. I also have inherited 2 x Framed paintings by J.D.LIDELL of the ship before and after the fire, they hang proudly in the lounge. We would love it if we could find out more about why Grandad was there. Hi Ian and all participants. I am researching my Paternal Grandfather, until a few days ago I had just a photo of him as he passed in 1925, and my Father has gone, had no history on him. I now have established that in 1906 he was “adopted” along with his brother on the loss of his Mother, and proposed to be transferred to Wellesley, by the Guardians of Ross, as he was then in a workhouse. Local people donated to fund them. I have an extract of the Guardians discussions posted in the Ross Gazette which details the costs of being on the Wellesley, he was there from 1906 until 1914 where he joined RND Collingwood Battalion, but his younger brother died aged 16 ( 1913 ) presumed in service. I would be grateful if there are any photos of the boys to try and identify him from. If it is of interest to you of the Gazette report I am happy to post the extract. On my Grandfathers Sea Service Record it states his address as 17 Breamish Street, Battle, Newcastle, in September 1914 so I assume that the Wellesley was not given as an address ? Apologies my sons name got picked up on the autofill !